If, like me, you are looking for something to play in the car to give you a break from the same 3 ABC4KIDS CDs on permanent rotation, I cannot recommend audio versions of picture books highly enough. 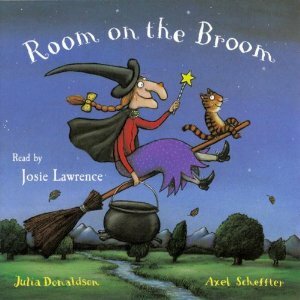 A really great place to start (for those with toddlers and preschoolers) is with Room on the Broom,one of the many beloved titles written by Julia Donaldson and illustrated by Axel Scheffler. Room on the Broom is performed by actress Josie Lawrence with all the appropriate voices and is perfectly accompanied by great sound effects and small amounts of music that really help to build the story elements and convey the emotional state of the characters. The CD has two tracks, the first is the reading of the story and the second is a song version of the story which is also written by Donaldson. The length of the audiobook is just over fifteen minutes, making it ideal for listening to in the car on the way to the shops or for preschool drop off. The great natural rhythm and rhyme that Donaldson's books are so well known for is perfectly captured in Lawrence's reading and the audiobook format allows listeners to use their own imaginations to 'illustrate' the story and fill out the finer details. Once my kids had adjusted to the idea that there were no pictures (either book or TV screen) to accompany the audio, they sat back and were happy to listen quietly to the story being told. I can only imagine how this will benefit them in honing their listening skills and stretching their little imaginations. I found the Room on the Broom audiobook so enjoyable, for myself and the kids, that we listened to it half a dozen times before eagerly reaching for more of Donaldson's titles in audio format. Click through for a full review of the Room on the Broom picture book.